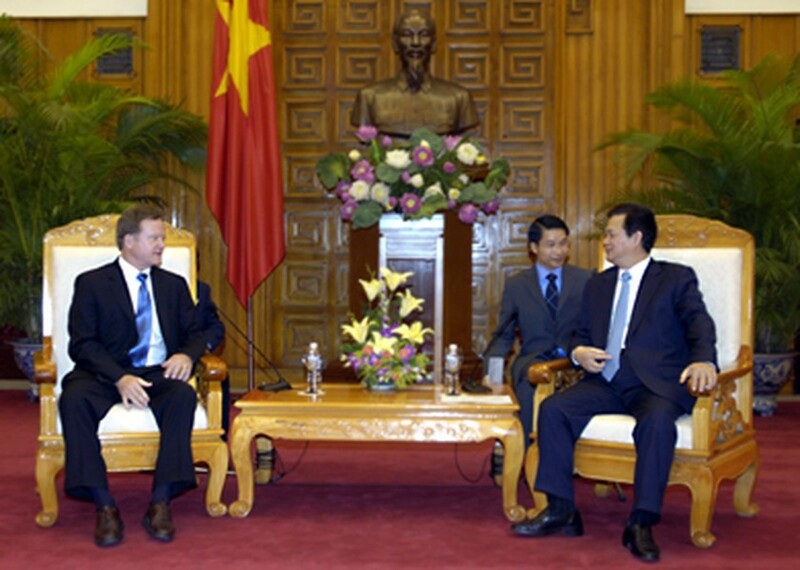 Vietnam wants to boost cooperation with the US for the benefit of both countries, said Prime Minister Nguyen Tan Dung at a meeting with US Senator James Webb in Hanoi on July 8. On behalf of the Vietnamese government and people, the PM spoke highly of the visit made by the member of the US Senate Armed Services Committee and Chairman of the East Asia-Pacific Sub-Committee under the US Senate Committee on Foreign Relations that coincides with the 15th anniversary of the diplomatic ties between the two countries. The visit will help boost bilateral cooperative ties for mutual benefits, said the PM while expressing his pleasure at fine developments in the two countries’ relations over the past 15 years, especially in economics, trade and investment. At the meeting, PM Dung asked Webb to persuade the US administration not to set up barriers against Vietnam’s exports, especially seafood products such as tra fish and shrimp as these products help improve Vietnamese poor farmers, and to provide more scholarships for Vietnamese students and build the US University in Vietnam. While welcoming the US Secretary of State Hilary Clinton’s visit to Vietnam to attend the ASEAN Regional Forum (ARF), Dung expressed his hope that the US President Barack Obama will attend the ASEAN-US Summit which is scheduled to take place in Hanoi at the end of this year. For his part, Webb said he witnessed the fast development of Vietnam as well as the Vietnam-US ties over the past years and believed the two countries’ ties would continue developing in the future. The US senator pledged that he would do his utmost to boost the two countries’ cooperative ties in the fields of economics, trade, investment and education and training. While congratulating Vietnam on taking the chair of the ASEAN, Webb said he was very interested in Mekong river issues and affirmed he would help Vietnam and other regional countries cope well with the climate change. Regarding to the recent situation in the East Sea, Webb said that relevant countries should cooperate with each other to ensure peace and maritime security under international laws and any disputes should be settled by negotiations, but not by force and threatening to use force. The US supports the regional countries in the search of a long-term solution for the East Sea issue, said Webb, adding that first and foremost, relevant countries have to strictly abide by the Declaration on the Conduct of Parties in the East Sea (DOC).